When you are going to be a new parent, there are several things you need to have. The baby needs a bed, changing table, baby tub and at some point, a Jumperoo. As the baby gets older and more into things this will come in handy. As with all baby items parents want to know which brand carries the best Jumperoo for baby safety and satisfaction. In this article, we will discuss why you need to have a Jumperoo and give you reviews on different brands. Unfortunately, in this article, we can’t review them all but it’s a good start. What exactly is a jumperoo? 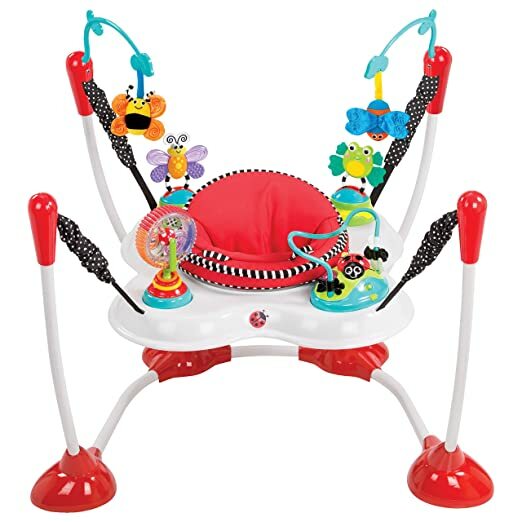 It is a combination of a baby swing and spinning seat with toys, lights and other entertainment all around it. 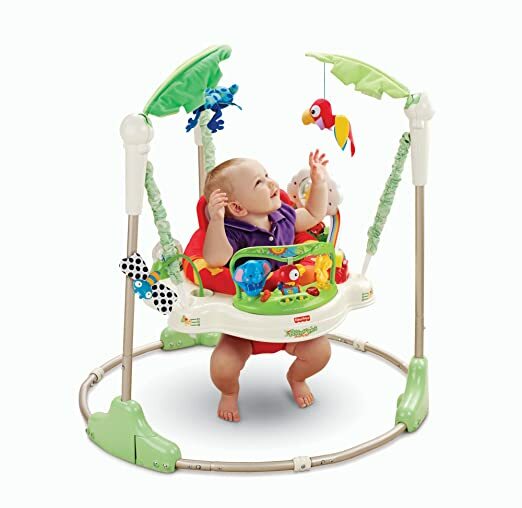 It gets its name jumperoo from the fact that the baby is lifted off the ground just enough to allow the baby to bounce. Many parents wonder what age their babies can start using the jumperoo. According to manufacturer’s parents should use the jumperoo when their baby is able to hold their head up without help. On the other hand, parents should stop using the jumperoo when their baby can climb out. If a parent continues to use the jumperoo after this time frame it can cause the baby harm. Some jumpers will have music to go which allows them to create action and response awareness. The main function of a jumper helps your baby develop leg movement. You place your baby in an upright position which gives them a different feeling of independence. A jumper is also a great item because of the educational benefits, the fun, and the reliability it can provide. The most time a baby should be left in the jumperoo is around 10 to 20 minutes. If your baby cannot stay in the jumper this amount of time without their neck getting tired, then they are not quite ready for the Jumperoo. There are three different types of jumpers. The first type of jumper hangs on the door frame and looks more like a sling. The second jumper has more of a stationary framing and sits on a flat surface like the floor with the seat being suspended so far from the ground. The third is just like the second one except the seat is placed directly on top of a spring instead of suspended off the floor. The best Jumperoo for baby safety in your home will depend on space. With everything good, there are other things to consider like developmental risk it can cause and any safety risk it may have. It is important that the baby is placed in the seats correctly so that their weight is distributed across their hips correctly. Leaving the baby in the jumper too long can cause neck and back problems. Another risk is babies getting conditioned to walking and operating on their toes. This comes from the babies having to be on their toes to bounce. The safety risk that comes with the jumper is head injuries from mechanical issues with the sling jumper. The jumpers that have springs run the risk of pinching the baby’s fingers. Other safety issues come with the jumpers that have small parts. If any of these parts come off the baby can get choked on them. There is a lot to consider when purchasing a jumper but they are good entertainment for babies. The best Jumperoo for baby safety has more to do with following the instructions and paying close attention to your baby while they are in it. 1. 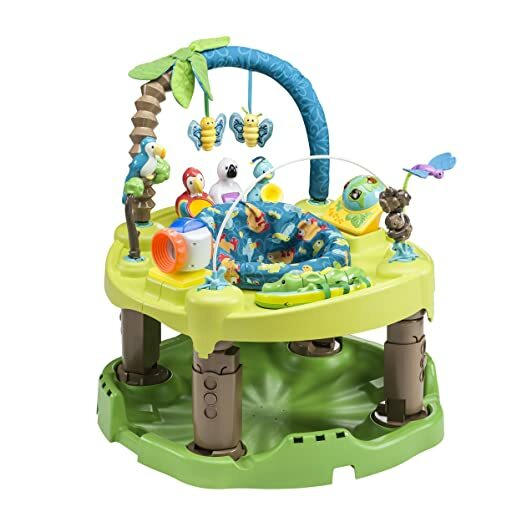 Fisher Price Rainforest Jumperoo. This jumperoo has a 4.8 rating. With its simple frame, which makes it visibly appealing and easy to move around. It is entertaining to the baby because of its music, sounds, and lights. It has an adjustable seat that allows you to change the height according to the baby’s growth. It is entertaining to the baby because of its music, sounds, and lights. It has an adjustable seat that allows you to change the height according to the baby’s growth. It also has a 360-degree swivel chair which allows the babies to spin and have full interaction. This brand also collapses for easy travel and storage. This jumper has a 4.5 rating and is plain fun to look at, and stylish with its cartoon designs is 100% polyester. It comes equipped with toys, height change, and other amenities. Some of the available models are the Beach Baby, Jam Session, Jungle Quest, Bee, Zoo Friends, Safari Friends, and My First Pet. This jumper would be perfect as one that is only used at home. This one is perfect for the nursery or living room. This one is not a good choice if you need the jumper to travel. This jumper has a 4.6 rating and a light-up piano with volume control. It doesn’t just play jingles and classical music. With over a dozen activities to choose from your baby has plenty to keep their attention. It comes apart very easily and its height adjust. It also has a function that teaches Spanish and French. This jumper has great technology like language educational and music. Studies have shown that the earlier babies are introduced to these things the smarter they will be. This jumper has a 4.2 rating and is a great exception to other jumpers. This jumper hangs on the back of the door. This is made of polyester and easy to transport. This one is great for someone who wants to have the luxury of both the door hanger jumper and the floor model one. This Jumper has a 4.4 rating and as the Baby Einstein jumper. 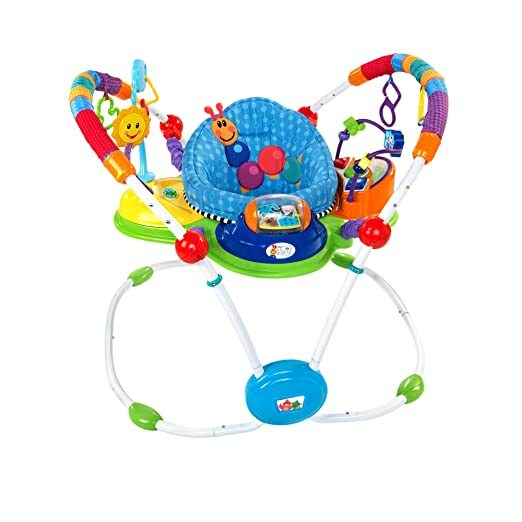 It has very brilliant colors and grabs the baby’s attention with an arching toy loop. The Bright Stars jumper comes equipped with a light-up music station. This station has a piano and other fun melodies. It has 5 adjustable height levels and has the ability to be folded. Some of the models include Cute Critters and Giggle Bugs. This one is good for parents who want one as a starter jumper. Because of the size it is meant to hold smaller babies and it look like babies would grow out of it quickly. In our research, we found that parents saw both the benefits and the dangers in jumpers. The main thing they were looking for is mobility, entertainment for the baby and space it occupies in a room. As far as developmental risk and safety risk they seem to depend more on whether the parents follow the safety rules. The main risks a parent wouldn’t have control over is the malfunction of the door jumpers and the baby’s hands getting pinched in the spring. In this article, we gave you five of the best jumpers that rated at a 4.0-4.5 in reviews. 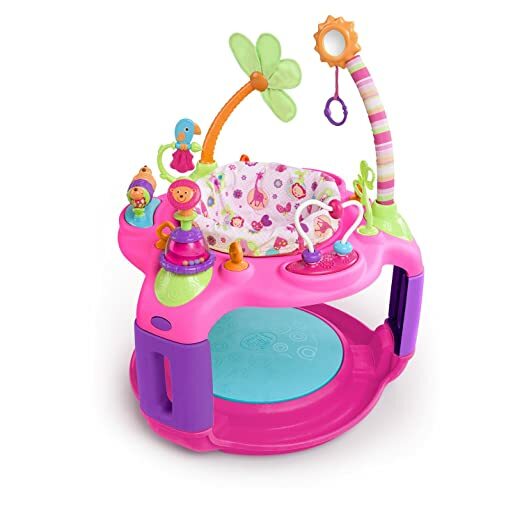 While writing this article, we found that the best Jumperoo for baby is the Baby Einstein Musical Motion Activity Jumper This is based on size and all the technology it has.